LYNCHBURG, VA -- A customer at a Chick-fil-A in Lynchburg, Virginia, had an unexpected visitor while he was using the restaurant's toilet. Andrew Hall was attempting to use the restroom when he was interrupted by a kid who popped his head under the stall, wanting to know what his name was. Hall posted the hilarious video to Twitter. 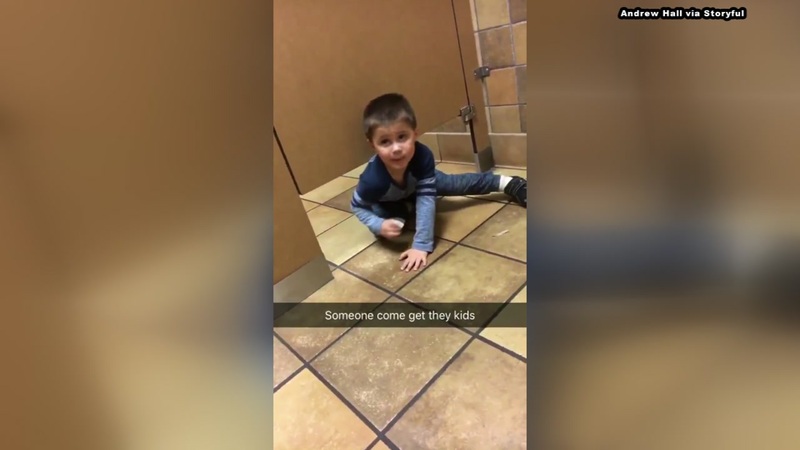 The video shows the kid crawl under the door and into the stall, engaging his newfound friend in conversation. The boy says that he needs help washing his hands, to which Hall laughingly responds that he thinks they boy's mom might be outside. The kid then leaves, opening the cubicle door to get out, and hilariously suggests Hall locks the door. The priceless exchange has racked up over 230,000 retweets -- including a response from a man claiming to be the boy's father. "Hey, Drew. That's my boy. I'm terribly sorry for the intrusion. He's very, very friendly, sometimes a bit too much. You handled it extremely well," Len Stevens posted on Twitter. "Thanks for being kind to him. I truly appreciate your understanding and sense of humor about this!"